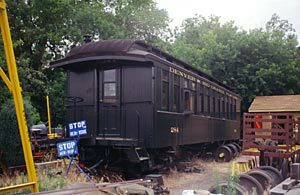 D&RGW coach car #284, built in 1881 by Jackson & Sharp. It was restored to its late thirties appearance, including its bay windows, a time when it was used on the Chili Line mixed trains. 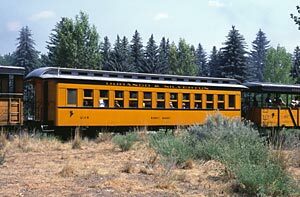 Coach car #331 Trimble, built in 1963 by the D&RGW Burnham shops especially for the Silverton train, its steel structure was designed to make the car look like the wooden 19th century passenger cars. Coach car #291 King Mine, built in 1881 by Jackson & Sharp for the D&RG. Transformed into a bunk car in 1924, it has been converted back to its original configuration by the D&SNG shops in 1985. 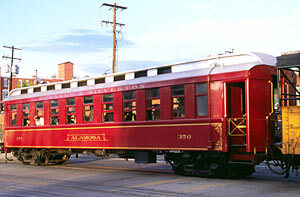 Rio Grande open platform coach car #256, whose body is preserved at the Colorado Railroad Museum. It has been previously used as an office on the Monarch branch. 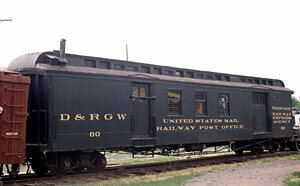 Mail & baggage car #60, built in 1880 by Billmeyer & Small. It was rebuilt in 1889 after a wreck, and was modernized in 1937 for service on the Shavano and the San Juan. It was converted to a work car in 1951. 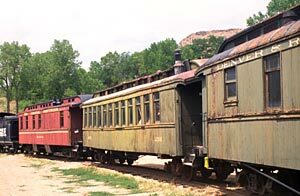 Parlor car Alamosa, originally a chair car built by Jackson & Sharp in 1880. 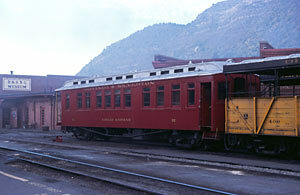 It was modernized and converted to a parlor car in 1937 for use on the San Juan. 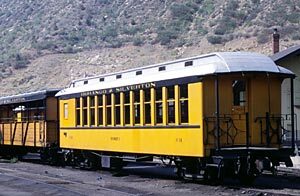 Steel coach car #333 Tacoma, built in 1964 by the D&RGW in Burnham for the Silverton train and today in use on the Durango & Silverton Narrow Gauge Railroad. 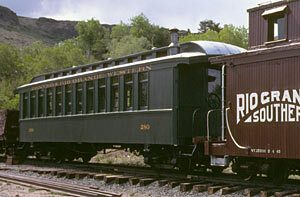 Coach car #280, seen at the Colorado Railroad Museum. 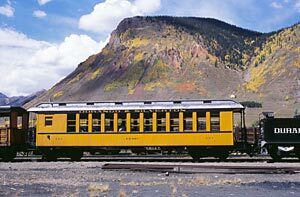 Built in 1880 by Jackson & Sharp, it got the gold livery applied to the Silverton train in 1950 before being sold to the city of Boulder in 1952. D&SNG private car Cinco Animas, originally an emigrant sleeper car built in 1880 by the D&RG. It was transfered to non-revenue service in 1903 and later became D&RGW business car B-2.